Training began at 5:30 a.m. with my client’s third hour of his 10 hour course in Basic Self-Protection. We warmed with simple movement exercises designed to prepare him for the straight rear hand strike. This was performed first as a target familiarisation exercise, which is an important part of mental conditioning. I have known many people who can hit targets hard, but have a problem when it comes to actually hitting people in a pressure tests. We then used a Dennis Jones drill involving moving into an individual. 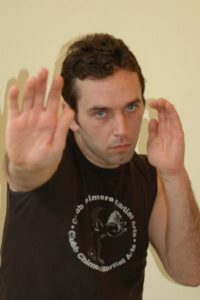 This is another piece of the matrix of fighting, as it allows the student an idea of what it feels like to hit a body. Next we took everything onto the focus mitts. First revised and reviewed the fence line-up and striking. From here we did some restrictive work and then looked at how it improved my client’s technique and general impact. Then I introduced incidental combinations. This was followed with the removal of obstacles. Finally we did some basic transitional work, training to fight from lying down, sitting up, kneeling up and standing. There are four postures and three transitions. I introduced him to the movement sequence and also the deck squat for homework.